In this work, a photobioreactor with microalgae biofilm was proposed to enhance CO2 biofixation and protein production using nickel foam with the modified surface as the carrier for immobilizing microalgae cells. The results demonstrated that, compared with microalgae suspension, microalgae biofilm lowered mass transfer resistance and promoted mass transfer efficiency of CO2 from the bubbles into the immobilized microalgae cells, enhancing CO2 biofixation and protein production. Moreover, parametric studies on the performance of the photobioreactor with microalgae biofilm were also conducted. 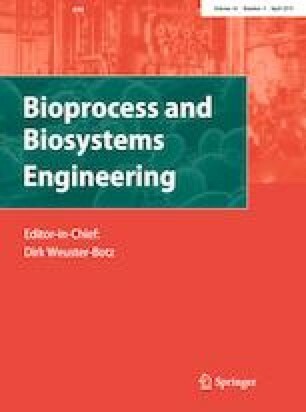 The results showed that the photobioreactor with microalgae biofilm yielded a good performance with the CO2 biofixation rate of 4465.6 µmol m−3 s−1, the protein concentration of effluent liquid of 0.892 g L−1, and the protein synthesis rate of 43.11 g m−3 h−1. This work will be conducive to the optimization design of microalgae culture system for improving the performance of the photobioreactor. The authors gratefully acknowledge the financial support by the Fundamental Research Funds for the Central Universities (No. 2018QNA10).